Unlike his naval colleagues serving on surface ships, a fully qualified submariner, whatever his trade, can take an individual through his boat and explain, in great detail, what everything in the boat does and how to operate it - even in complete darkness. That takes training and it is called earning your dolphins. Why the Dolphin? 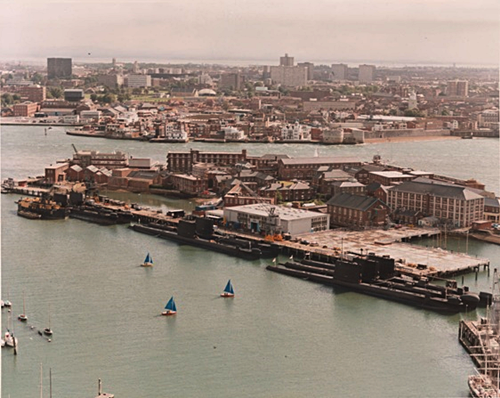 HMS Dolphin was an old training vessel moored at the Royal Navy facilities at Gosport, in Hampshire, England. From 1904 to 1999, HMS Dolphin was used as the supply vessel for the Royal Navy Submarine training centre which took its name from this old warrior. While the school has passed into legend (now training is done at HMS Raleigh and it will soon be headquartered at HM Naval Base Clyde), the pride in the gold standard of the dolphin lives on. Canadian, American and Australian submariner training programs have all grown out of this standard and adapted to meet the demands of their individual fleets. Approximately two dozen Royal Canadian Naval Volunteer Reserve officers served on British submarines during World War II and a further 400 naval personnel served on British subs between 1950 and 1965 when Canada instituted its own Submarine Service. Many of them did their training at HMS Dolphin. Today, the current Canadian qualification program has evolved from both the Royal Navy Submarine Service and United States Navy Submarine Service creating a seven month program requiring a complexity of knowledge and skills similar to that of the U.S.N. and utilizing many of the training features of the British system. This does not mean that after seven months a submariner is qualified. 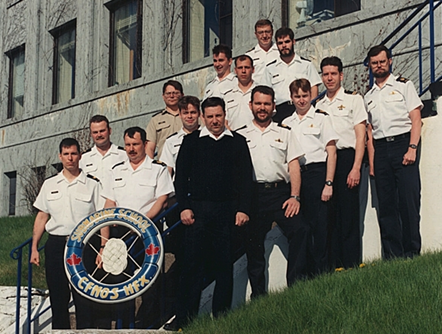 A tentative submariner first attends a 6 week basic submarine course in Fleet School Halifax. Course content is a comprehensive study of submarine theory of operation, submarine systems covering all aspects of submarine equipment such as air systems, hydraulic systems, electrical systems, weapons systems, sensors and so on; in other words virtually every system in the submarine is addressed. On completion of the basic submarine course the novice submariner joins a submarine and commences his on board qualification program. Submariners serving on the west coast often train with their American counterparts while those serving on the east coast may do some training with their British colleagues. The first month of training consists primarily of items, systems and procedures vital to submarine safety such as location and use of all fire fighting, life support, first aid equipment, submarine escape systems, mainline and trim line, casing fittings and knowledge of all major on board safety evolutions. The second month consists of learning the complete hydraulic system layout, all control valves and the equipment operated by hydraulics, the third month is all air systems and so on. This is a challenge with the lights on, imagine what it is like having to know how to do everything in complete darkness! For this reason, every item has a distinct shape that must be learned as well. Over the seven month period all systems are covered which includes "chasing" each system through, (viewing each pipe, switch, valve etc. in each system) and drawing detailed, functionally correct diagrams of each system. The qualifier must be able to not only describe the theory of operation of all the equipment learned during this process; he must also demonstrate the ability to use it in most cases. As the qualifier progresses through the various systems and procedures in any given month he must demonstrate his knowledge of the particular item, what its purpose is and how to operate it to a qualified member of the crew who will "sign off" the item in the qualifier's book as completed once the qualifier has demonstrated the correct knowledge. Once the qualifier has completed all items for that month he is given a walk through by a senior rate who is expert in the area being covered for that month who examines the qualifier in all aspects of what he has learned. On successful completion of the senior rate's walk through the qualifier does an officer's walk through and on successful completion moves on to the next month. On completion of the 7 month program the qualifier must do a final walk through of the submarine first with the Engineering Officer and then the Executive Officer during which the qualifier is examined in all aspects of what he has learned both in theory and "hands on" operation. This is not a superficial walk through - lives depend upon mastering these skills. A final walk through normally takes 8 to 10 hours to complete and is done over two or three days and includes open up to dive in all compartments. Only Part of the Job! Rarely does the qualifier complete the qualification process in 7 months. The qualifier while completing his submarine qualification is also at the same time learning his own trade related items and equipment, standing watches and carrying out all other submarine day to day requirements. There are also many variables such as equipment availability, docking and leave periods, availability of walk through personnel and so on which tend to slow the process down somewhat. On average it is closer to a year before all is said and done. In addition, the qualification process is done during the individual's "off" time with the help of his 'Sea Daddy', not while he is on watch or while he is working which makes for a pretty weary lad at times. On successful completion of the qualification program the qualifier is awarded his "dolphins" with much ado and great fanfare. 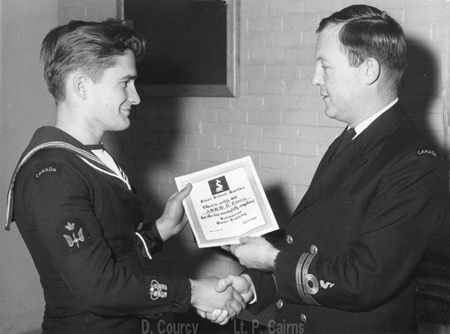 Traditions vary from navy to navy; in Canada the newly qualified submariner is thrown in the harbour. George Sullivan, writing on the Submariner's Association of Canada - Central website suggests, 'The smart qualifier tries to time his qualification to finish while the boat is south in warmer waters!' George continues by revealing the secret of the continuing bond amongst submariners - the newly qualified proudly sport their dolphins on all their kit but the work has not come to an end. They will go forward helping new submariners through their qualification program in a never ending process of learning and teaching. The exception to the all knowing rule is of course the nuclear submarine which has certain no go areas restricted to specific personnel. The nuclear submariner certainly knows his boat; however, not to the degree submariner in a diesel submarine does. It is worth repeating here that nuclear is not necessarily better. As the saying goes 'it depends'. A nuclear submarine is noisy - the power source is always running. A diesel submarine, on the other hand, is extremely quiet and therefore continues to have its uses particularly in littoral waters where its smaller size has the advantage.